Is a High Protein Diet the Best Diet? Protein is a nutrition buzzword right now and for all the right reasons. Protein not only helps rebuild lean muscle mass, it also helps maintain blood sugar and slow digestion, therefore keeping you full longer. But here's the real question is a high protein diet the answer to achieve weight loss and maintain health? High protein diets have proven themselves in the dieting world among the masses who have followed the paleo diet, Whole 30 or their own variation of a high protein eating pattern. With that being said there is a flip side to the success of a high protein diet that has shown to be far too common. They don't always stick. The high protein dieter eats nothing but animal protein and non-starchy vegetables for an extended period of time, they lose a bunch of weight and feel great, and then they allow themselves to indulge in the ever so satisfying carbohydrate. Then a few days later they do it again, and again until eventually they have gone back to their previous eating plan and are thinking about ditching carbs all over again to re-lose the weight they've gained back. Carbohydrates are important for every single healthy person. There are circumstances where a low carb diet is recommended and those in those situations are often related to a chronic illness or prescribed in a hospital setting. Otherwise, carbs are a daily necessity. Carbohydrates come from a variety of sources including, grains, legumes, beans, fruit, vegetables and dairy as well as less natural sources like candy, sugary beverages, sauces and other sweetened processed food items. The carbs from the natural sources (grains, legumes, beans, fruit, vegetables and dairy) are processed and broken down in our body differently than the list of processed carbohydrates above. The natural carb-rich foods contain other nutrients like fiber and protein for example that help slow the digestion of carbs. Natural sources of carbs also always contain vitamins and minerals that contribute to health and are important components of a balanced diet that should not be skipped, like fiber and antioxidants. Now for more details on protein, research has concluded that a high protein diet is the optimal diet for those wanting to lose weight, build muscle or even just simply maintain a healthy weight. As stated previously, protein is an extremely important part of the diet and has some obvious health benefits. So what's the deal? Is a high protein diet low carb the answer, even though carbs from natural sources are also a great addition to daily meal plan? Here's the answer: A high protein eating style is great, but a no-carb eating style is not. That means that we should include lean protein with meals and snacks, BUT we should also include complex carbohydrates throughout the day as well. Carbs are not the enemy! The takeaway of this article is simple. Don't fall for the high protein low carb diet trend, instead use it as a foundation for a more balanced style of eating that includes all food groups including your favorite less healthy foods. Maybe consider following the 80/20 rule or the 90/10 rule, but skip the hassle of a restrictive diet and simply follow an eating style that includes lean protein sources (animal based or plant based), lots of fruits and vegetables, plenty of whole grains and a few servings of healthy fat each day. Need help finding balance in your eating styles? Reach out to Rachel, the Core Studios Dietitian, for guidance and support on jump starting your healthy habits today! Welcome to our State of the Art Indoor Cycling Studio! We offer stadium-style seating, MYZONE heart rate monitoring board, towel service and water. We will walk you through the proper steps to setting up your Keiser M3. Our goal is to give you all the information upfront to make your first ride with us a wonderful experience. Standing next to the bike that you choose, lift your leg to a 90° angle next to the seat. Your hip should be in line with your seat and placed at the correct letter (i.e., G or K) which is found on the shaft underneath the seat. Behind the seat is a black knob that you can loosen and put at the height of your hip. Next, come back around the bike and sit down; this is where you will either "clip in" or put your foot into the cage. The "clip in" option would be if you have cycling shoes equipped with a cleat on the bottom. Our bikes support SPD or LOOK clips. If you will be riding with tennis shoes, you will turn the pedal over to allow your foot to slide into the cage. The strap to the side is there to either tighten or loosen based on comfort level. With your hands on the handle bars begin to slowly pedal. One leg will be at 6 o'clock and the other at a 9 o'clock hour. Your 6 o'clock leg is very important (for your seat height) and should have a slight bend in your knee. If your leg is completely straight and you are hyper-extending your leg then your seat is too high. If no adjustments are needed, next we will determine your 'fore' and 'aft'. This is essentially your seat going forward and back to which you will understand while sitting on the bike. Under the seat is a handle that will allow you to push the seat forward or backwards. This system is determined by numbers opposed to the letters for the seat height. While on the bike, with your hands on the handle bars and your legs at 3 o'clock and 9 o'clock. Your 3 o'clock knee should be in line with the thickest part of the ball of your foot on that same leg. IF your knee is behind, right at the ankle, you may want to bring your seat forward a little. If your knee is behind completely - definitely bring your seat forward. This is important because while riding you will only feel the knees and not the posterior chain. Make any adjustments at this time and get back on the bike. Get back on the bike and begin pedaling with the handle bar height being your last adjustment. If you are an experienced rider, you may want your bars lower and beginners a bit higher. To make any adjustments, the shaft underneath the bars will be where you would bring them up or down using the numbers that are facing the seat. When you find the proper position, be sure that all knobs are tightened securely! You are now ready to kick off an amazing ride with us at CORE! Our goal is to help individuals learn to establish the proper feet position based on their hip architecture for performing a proper squat. We start by showing the limit of each persons body in a quadraped position. With the knees together, one would slowly shift backwards until the break in the spinal position. That will show you where your spine and pelvis start to change position which is not what you want under a weighted load for safety. Next, you will need to increase the width between the knees to look for the spinal break and see if you are able to keep that same depth. With the knees completely open hip-width apart and feet aligned proceed to shift backwards again looking for that break point. This will give you the best idea of where to take your squat in standing position. From your standing position, with light weight of some sort (i.e., kettle bell, dumb bell) in your hands, adjust your feet to the width based on your floor position in the previous step. Keeping feet aligned with the knee, elbows are going in towards the inside of the knees. Maintain a neutral spine as you lower into your squat stopping right before the breaking point that was discovered in the previous exercise and then back to standing squeezing your glutes on the way up. Knowing how to squat properly will enhance your workouts safely while giving you the desired results. Protein is a nutrition buzzword right now and for all the right reasons. Protein not only helps rebuild lean muscle mass, it keeps you full and helps maintain blood sugar. Opt for lean protein sources including chicken, pork, turkey, fish and plant based protein sources like tofu, tempeh, seitan, legumes and beans. Avoid choosing protein options that are breaded or paired with heavy sauces, like alfredo or a butter sauce. Grilled, baked, broiled and seared cooking techniques are going to offer just as much flavor without all the extra calories, fat, sodium and sometimes even sugar. Find a lean protein option that is simple and seasoned with herbs and spices versus heavy or sweetened sauces and breading. Carbohydrate based meals like pasta, white rice or Asian noodle bowls are expensive in the carbohydrate department and typically leave you feeling overly full. Skip pasta and carbohydrate rich meals at restaurants and include them with meals prepared at home when you are in control of the portion size. Look for dishes that are inexpensive in carbohydrates and are nutrient rich. Non-starchy vegetables are your go to side, but including a single serving (about ⅓ cup) of a starchy vegetable, like beans, or whole grains is going to be a better option than refined grains like white rice and pasta. For example, go for a sizzling chicken fajita skillet without the tortilla and side of rice at your favorite Mexican restaurant, or riceless chicken and veggie stir fry with an extra side of steamed vegetables at an Asian restaurant. 3. Ask for Dressing and Sauces on the Side, Condiments as Well! Most people don’t love a dry salad or wrap, but sauces, dressing and condiments are best to be sent to the side and added in moderation. Sauces not only pack in the calories, but also the sugar and sodium. Sauces like teriyaki, barbecue, sweet chili and even some tomato sauces have hidden sugars that can spike blood sugar and cause cravings shortly after a meal. Try dipping the tip of your fork in your dressing or sauce with each bite instead of pouring the entire cup over your salad or meal. Also consider switching out heavier sauces or cream based dressings for a lighter option, or ask your serving for a few lemon and lime wedges to squeeze over your meal to add flavor without the all the calories. Choosing vegetable based meals or adding an extra serving is always a good decision. The addition of a side salad, steamed vegetables or roasted vegetables will add color and therefore nutrients to your meal and help fill you up. Look for non-starchy vegetable options like broccoli, sauteed spinach, asparagus, fresh tomato salad or sauteed mushrooms to replace carb rich or starchy vegetable sides. You can almost always order a side of vegetables a la carte, but if at a deli or “Made to Order” cafe take your sandwich through the garden and add all the vegetables they have to offer, you won’t regret it! When the server puts a basket of bread on the table it is nearly impossible to resist snagging one and slathering it with butter. Then, you finish the first one and there is just one left in the basket before your meal comes so you end up having one or two more than you had initially planned. Consider skipping the bread basket all together if you can catch the server before they put it on your table. You won’t miss it, but if it’s there the challenge of not having it will be a tough one to conquer. Skipping the roll is also good practice when ordering a sandwich. Sliced sandwich bread, rolls and buns have gotten larger in the last few years and because of this they often pack more carbohydrates than we realize. Consider ordering your sandwich or burger “naked” (without the bun) or swapping out the bun for a whole grain wrap. Water should always be your go-to drink order at a restaurant, but if you’re looking to switch it up consider unsweetened teas, or club soda with a few lime and lemon slices. While diet soda is zero calories, it is not the best low calorie option. Research is showing that our bodies react to artificial sweeteners similar to the way it reacts to full calorie sweeteners. Artificial sweeteners, like aspartame, can actually promote weight gain and cause carb cravings hours later. Skip diet beverages and drink lemon water both before and after your meal. Water not only helps to promote proper digestion, the lemon flavor will cleanse your palate and help curb cravings for sweets after a savory meal. Take time to look up the menu before making the reservation. By planning what you want to order before you get there, you will avoid making snap decisions on an empty stomach that you might regret later. Some restaurants include nutrition information on their websites that can help guide you to the healthier options. Choose restaurants that include healthy choice categories on their menu or the ability to build your own meal. Don’t hesitate to ask for switch ups of sides, sauces or cooking techniques, you might be surprised on how accommodating restaurants are and your health is worth it! Remember you are paying for this meal and therefore it should be enjoyed, not inhaled. There is a popular mindful eating technique that recommends you put your fork down between each bite and it really works! This not only lets you contribute to conversation, but also gives your stomach a chance to send signals to your brain that it’s full before you’ve eaten the entire plate and seconds later are feeling over stuffed and bloated. Mindful eating is a good practice not only while eating out, but when you’re enjoying a meal at home as well. Try slowing down and tasting your meal with each bite. About half way through your meal take a moment to assess your hunger and decide if you want to save the second half for later or if you are still hungry. Inflammation can wreak havoc on the body making activities of daily living nearly impossible, let alone maintaining a workout regiment. Inflammation can be caused by common ailments including arthritis, chronic illness or autoimmune diseases to list a few and believe it or not the lack of exercise and poor diet can also create inflammation in the body. Proper diet and exercise can help negate inflammation responses in our bodies and assist in the proper recovery and maintenance of everyday bodily processes. It is common to think that exercise can actually harm our joints and should be avoided if you have arthritis or joint inflammation, but research is concluding just opposite. A recent study by the Mayo Clinic strongly concluded that light exercise can help ease joint pain and stiffness. Diet is also an important variable in reducing inflammation in the body. First, it is important to avoid foods that cause inflammation. Foods including processed foods, refined grains, red meat, fried foods and dairy can create an inflammatory response and should be avoided or eaten in moderation. On the other hand there are a variety of foods that can actually reduce inflammation related to chronic pain, illness or exercise. These foods contain powerful antioxidants and polyphenols that protect and rebuild damaged cells. Denise Chakoian has been Owner and the Lead Fitness Professional of CORE Studios for the last 11 years and during that time she has worked to share her knowledge, energy and expertise with RI residents. In this podcast, Chakoian joins Performance Physical Therapy CEO Michelle Collie to talk about what you should look for in a gym, why you should monitor your heart rate when working out, and what kinds of fitness fads you should just avoid. At CORE Studios, one of Performance Physical Therapy’s community partners, Chakoian says she and her staff always strive to make sure their classes are safe, that each client is considered and that everyone feels like family. Listen in as Chakoian shares her thoughts, tips and more in this week’s #BETTER #FASTER podcast. Here is an excellent tutorial on how to do a push-up with proper alignment. The benefits are endless when done correctly. Here at CORE Studios, we provide dynamic, challenging smart workouts. To effectively deliver this in the class room or in a private lesson, we are always checking for proper form. One basic move, such as a push up, can be done effectively yielding great results. However, if done improperly, the results will be quite different and possibly end in injury. You will begin in a quadruped position (prone position all fours). Start by holding your bodyweight with your shoulders over the wrists, and your feet are in either a shoulder width position or, if more advanced, feet together. At CORE, when a postural test is done, we use a rod to place on the back of the clients head, shoulders and glutes as they lower down into a push up. This test shows us whether or not the spine is moving, extending, or the shoulders are collapsing. A proper push up is a functional basic bodyweight move that will enhance a workout routine either at home or at the gym. This meal jar is the perfect go to for lunch and dinner on the go, and the jar creates the perfect portion control vessel. Try adding a sprinkle of parmesan to the rice or chicken to add a little extra flavor or switch out the asparagus for broccoli, brussel sprouts or sauteed spinach. Add rice and 2 cups of water to small saucepan. Cook on medium low heat for 30 minutes with the lid on. Saute onions and tomatoes over medium heat until tender, about 3-4 minutes. Cook chicken and add salt and pepper to taste. After chicken is fully cooked, top with fresh basil and remove from heat. To cook the asparagus, heat ½ cup of water in a saute pan until it starts to simmer. Cut asparagus into 3-4 inch pieces and add to simmering water. Cook for 4-5 minutes or until asparagus is tender. Layer ¾ c chicken mixture, ½ cup of rice and a fourth of the asparagus. Repeat in other 4 containers. 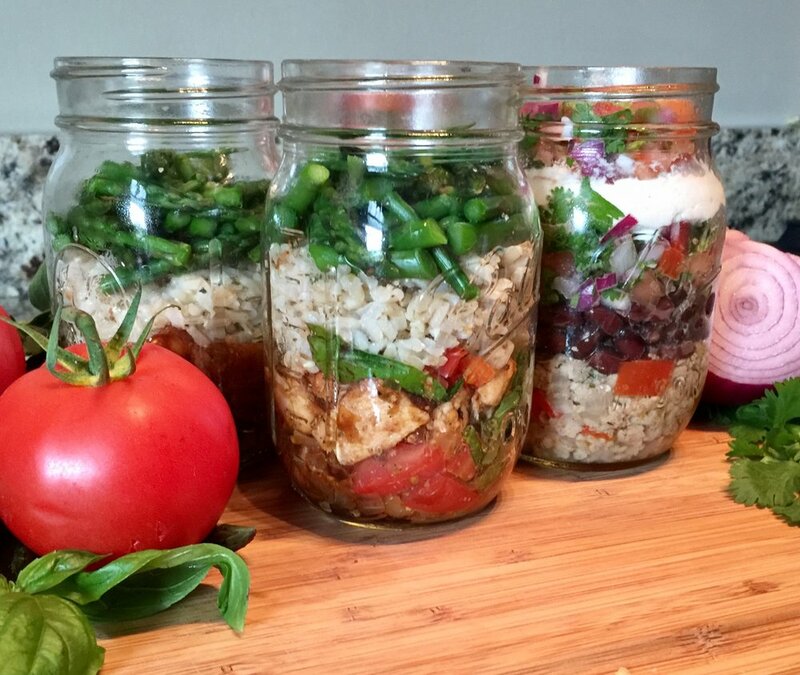 Healthy Meal Jars that You Will Love! Balancing health and convenience is not always an easy task, but with a little planning ahead and a few simple ingredients you can create on-the-go meals in a snap that you will love. After you’ve mastered the recipes below, get creative by switching out ingredients for other nutrient dense options. For example, exchange barley or quinoa for the brown rice in the Tomato Basil Chicken Jar, or try adding some extra green to the Turkey Taco Jar with avocado, salsa verde or romaine lettuce. When planning your jar start with a foundation of protein, starch and vegetables. Once you’ve decided on your main ingredients pick the flavor palette you’d like to add. Greek and feta chicken with stewed tomatoes and couscous, curried chickpeas with quinoa and roasted zucchini, lemon dill salmon with roasted potatoes and brussel sprout… the options are unlimited so have some fun and getting creative! Looking to make enjoyable changes that will last? Want more energy to do those day-to-day tasks? Have you jumped on the fad diet bandwagon that leaves you right where you started- unchanged? Rachel believes in eating real foods to fuel your body. Her motto is, "Feed your body well and it will treat you well!". Real change is only an appointment away. Why wait? 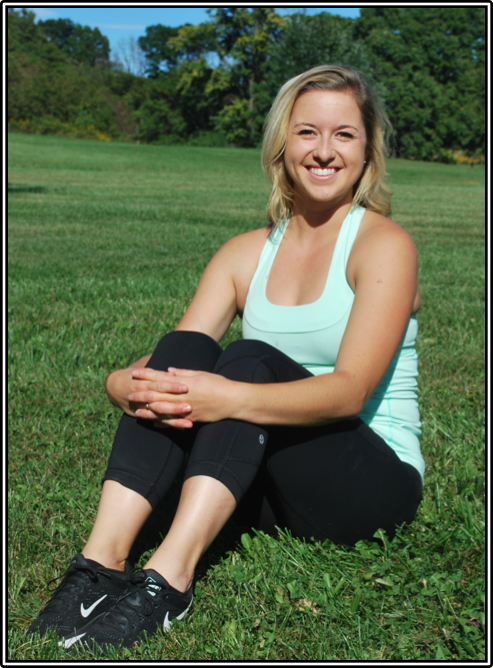 Rachel graduated from West Chester University of Pennsylvania with a Bachelor’s of Science in Nutrition & Dietetics. She then completed her dietetic internship through Pennsylvania State University and is an ACE Certified “Health Coach”. Her philosophy is simple, feed your body well and it will treat you well. Rachel’s interest in nutrition was sparked by her appreciation for health and her desire to share this gift with her community. She is interested in sustainable food practices, culinary arts and fitness. Prior to moving to Rhode Island, Rachel was the Head Chef for a non-profit organization based out of Oakland, California where she prepared meals for all ages and individuals with specialized diets. Her creative nature has brought her to love working in the kitchen creating healthful food choices that are good for the body and your taste buds! Take your fitness and wellness goals to the next level by adding nutrition coaching to your CORE workout routine! Interested in learning how to eat a whole food diet to reach fitness goals and maximize your exercise regimen? The Whole Food Fitness with CORE Studios workshop will dive into the details of how to properly fuel your body and stick to a workout schedule that is proven to show results. By including whole foods as the foundation of your diet, you will introduce the highest quality nutrients to optimize health and wellness at all levels of exercise. Find balance and motivation with this informational workshop hosted by Fitness Expert, Denise Chakoian and Registered Dietitian, Rachel Dreibelbis. The New Year is a great time to rethink your goals and get motivated, hope to see you there! 25 minutes of nutrition guidance on how to follow a balanced diet rich in whole foods. Attendees will be given a simple meal plan builder, shopping lists and other supportive materials on how to maintain a healthy and balanced diet. 25 minutes of informative exercise advice and incite to the latest research on how to optimize exercise.